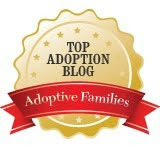 AdoptionTalk: Name-Calling: "You Dangerous Adopted Boy!" I've always rememembered a story my 6th grade Math teacher told about some people slinging insults at each other, and one emerged victorious by calling the other, "You hypotenuse!" Yes, the winning insult was "You longest side of a right triangle!" But it really does sound awful, doesn't it? Well, we've always known kids will sling insults about adoption, telling someone they're adopted when they're not as a way to say you're weird, or you don't fit in, or you don't belong. This is an adopted boy who needs to plumb the depths of his psyche. He was adopted. Many adopted children are tremendously well-adjusted, but for some reason, this man feels he’s unloved and unlovable, shunted to the side, and that’s the antidote he feels: unlimited power. And this isn't the worst of it, the same guy tags this "adopted boy" as "dangerous." Sigh. P.S. Dawn Davenport at Creating a Family is calling for a write-in campaign asking for an apology. You can get all the details, including addresses and a sample letter at this link. Malinda, at one point in your post you call David Brock (former conservative) David Brooks(perpetual conservative)...I think you meant David Brock throughout. Malinda, you changed the name from "Brooks" to "Brock". But in the November post you left "Lucky Chinese cat" in the post despite corrections by reader that the cat is NOT Chinese. I don't understand why you feel the November post does not need to be corrected. I find it ANNOYING when people mix up China/Japan/Korea, etc. To make a mistake is one thing--everybody makes mistakes. But to not correct the mistake is another thing. Anon, regarding the Lucky Chinese cat, I didn't make the change because there really is a question about when the lucky cat stops being Japanese and becomes Chinese. You find the cat all over China, Chinese people will tell you it is a Chinese lucky cat, and when told it's origin is Japan, they say, "So what?" Thus, it is not as simple as claiming it to be a factual error suggests. The discussion in the comments to the lucky cat post raises the issue, so people can make their own decision about whether it was error to call it Chinese instead of Japanese. When the error is about someone's name, that's straightforward enough to merit a correction in the text. There is no debate possible, there's no particular complexity, so I corrected it, despite the fact that the comments flagged the error. Malinda - I happened to turn to Fox during a commercial break and saw that "performance" by Ablow and Docey (sp?). Ablow was so out of line - the headlines they kept showing when he was talking that provided the viewer with these bullet points. 2001 Brock admits to mental breakdown - Ablow diagnosises Brock - etc. But during the headline running on the screen Ablow notes he hasn't seen him or treated him, yet he felt the authority to state with absolute conviction that it was his adopted status that was the sole cause of any issues Brock may have? Why the need to bring up his adopted status and call him a child and then state other adopted children are well-adjusted? Are adoptees forever children - never to become adults? That is the most annoying aspect of all. Unacceptable. I guess it was just my lucky day to flip to when that segment was on - it came off as a paranoid ranting by Ablow and Docey about someone trying to attack them (FOX). They came off badly - scraping the bottom of the barrel trying to find some dirt, any dirt to remove credibility. I just wonder why the adoption community hasn't made a fuss. If they have I would like to know what other AP's have talked about it because their children will be treated the same as adults. This does not shock most adoptees I know. It sickens us, but doesn't really shock us. "Most" of us are still treated like children- by our natural and adoptive families, by society and by our government. So yes, I was insulted by this dolt- but not surprised. I read/hear people call adult adoptees children on a daily basis. I know that Dawn Davenport, of the website Creating a Family, is trying to start a petition to get Fox to apologize. Actually not sure if the petition is hers personally, but she has been soliciting supporters on Twitter. I teach in China at a university (mom of 3 kids too), and one of my former students told me recently she was adopted. Some people in her town whisper about it to her, she didn't find out until she was about 10 years old. I'm wondering if you know of any resources in English and/or Chinese about what it's like being Chinese and being an adopted child (i.e. not being adopted and growing up, say, in the U.S.). Are there any studies about what it's like for Chinese people in Chinese society to be an adopted person? Many thanks if you can point me in the right direction. Thanks also for your great blog!